The station, which has just had its community radio licence renewed for a further five years, says the name change has been chosen the highlight its strong local credentials. The relaunch was marked by a special land train around the town and seafront of Exmouth, and the town crier rang his bell to announce the name change. Co-founder Andy Green had his car decorated with the new station logo on Friday and says he had to hide his vehicle from the public over the weekend. “We’ve had almost 100 texts into our studio today. Everyone wanted to guess the new name,” says Andy. 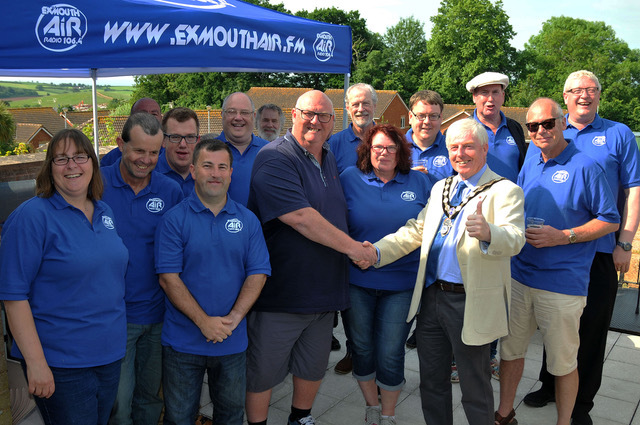 Exmouth Town Councillors Jeff Trail, Richard Scott and Christine Channon have backed the new station identity and the council has given financial support for the re-launch. Devon Signs donated the station’s new blue and white signage.